← Our very own nationally recognized Eye Surgeon Dr. Faruk Koreishi retires. Construction has begun on a new 9,000 square foot medical office on the Williams Road side of the Summit Mall complex. The new building will be occupied by Retina Consultants, a group of optometrists who specialize in the diagnosis and treatment of diseases of the retina and vitreous of the eye. The practice has offices at three Western New York locations, including one across the street from the new location in the Summit Healthplex. 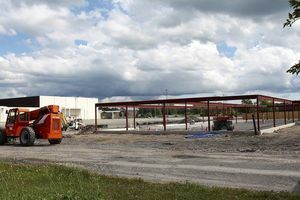 The building will be located near the main entrance to the mall off of Williams Road, near where the small M&T Bank branch used to be located. They firm purchased the property from new Summit Mall owner Zoran Cocov. The new building while have space enough for both Retina Consultants and another business. They plan to rent the space out, ideally to another medical firm. Another reason for the move, he said, is that the firm has outgrown its facility across the street. Patients often move through the process of exam, diagnosis and treatment quickly to save them time, money and to make things easier for the person driving them, as many of their clients are unable to drive themselves to and from appointments. The new facility will add two more exam rooms and two more screening rooms. While they do not perform surgeries, the new facility will be equipped for some of the laser procedures done by the four doctors, who are Paul Lee, Mehdi Khan, Christopher Jermak and Ramakrishna Ratnakaram. The new Retina Consultants is expected to open its doors sometime in October. Article originally post in the Niagara gazette.